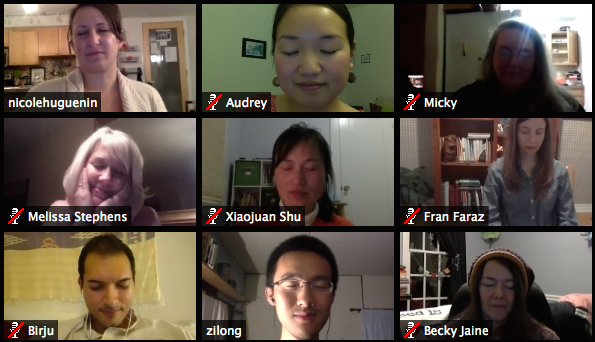 Tonight's call on gift ecology, organized by the amazing Nicole, left us answering our questions with more questions! Recently, Nicole and Zilong were discussing various things gift economy, and thought it'd be great to hold a call and invite co-create a conversation with other Laddership Circle alumni. Nicole sent out an invite, and 10 of us joined in, for a rich dive into the ever-expanding topic. We began by checking in and sharing how each of us was utilizing gift ecology in our own lives. Nicole led the conversation by sharing that she has lived the past year with a deep dedication to gift ecology. From leading her annual Love Walk on Valentines Day to trying to grow a gift ecology community in Colorado, she shared that at times she is being pulled from where her heart is. However, she felt fulfilled when after a new participant of the Love Walk expressed that she gained confidence that day. Becky backed up her gift ecology bus after participating in the October Laddership Circle when she realized that compassion for others was not supporting her household or her devoted husband who was working up to 70 hours a week. She discovered upon reflection that money can be a reflection of love, not a swear word, and that crafting a creative expressions art program for schools would be a way to balance the two. As she is going through the process of drafting this program, she is struggling with how to set a monetized value but also be mindful of schools who cannot afford that price. Swara shared that she has explored the question a lot, and has previously given up her job to see what would emerge in spirit of gift. She shed light on this notion with a beautiful story of how one man selling tea ended up gifting local women with selling their scarves as well. What started with one scarf has since turned into a huge enterprise that grew organically from the spirit of giving. This spoke to her, as her quest is one that is not external but internal and organic. Micky graciously shared her recently-published book of poetry, and her intention to gift-forward 50 percent of the proceeds. She then wondered what defines a full gift-economist? And wrote up some beautiful reflections on her thought process. Audrey opened by sharing her understanding that there is no one way to participate in gift ecology. Everything is unique to each of our circumstances and based on many factors. She then told us how she had a peaceful cash register experience when a friend wanted to pay for her tea. Audrey wanted to be the gifter but realized how important it was to let her tea cup overflow with receiving. She also discussed how there are consistent contributors everywhere who create like-minded givers through leading by example. Xiao expressed her desire to be free and not be trapped by the wording of gift ecology. She wishes to keep money flowing and not be bound by the form of money. Like a tree giving off oxygen but taking in carbon dioxide, we should not feel guilty when we receive cash. It is a necessary give and take of life. Finally, Birju offered that this ecosystem exists to help us answer the questions that we posed throughout the call: how can we express the idea of gift ecology so that is ripples further and further into the world? What creates the conditions for gift ecology to emerge? When we gift, is this for our own growth or the growth of the receiver? In the end, we all agreed that asking these meaningful questions often leads us to more questions...and that is a beautiful thing. Thank you for saving these seeds to grow further questions! :) Fran and Nicole's reframe of "retirement" reminded me of this. Peace Pilgrim said of "retirement": "Retirement should mean, not a cessation of activity, but a change of activity with a more complete giving of your life to service. It should therefore be the most wonderful time of your life - the time when you are happily and meaningfully busy." Melissa!!!! Thank you for capturing the seeds of our call so beautifully.